Transform is not unique in being given the runaround during the process of making an application under the Freedom of Information Act. But even we were surprised by the absurdity of what ensued when we requested a seemingly innocuous report in mid 2007. Danny Kushlick, Head of Policy at Transform, intermittently spent the next two and a half years jumping through a series of FOI hoops to get hold of a document that most who have seen it acknowledge is indeed fairly innocuous, in so far as it is not dissimilar to public domain publications by the same author, and was presumed to consist largely of data publicly available via the Home Office Development and Statistics site, and elsewhere, for anyone with the determination and know-how to hunt it down (see update above - this has proved to be the case). There are no state secrets here, just some fairly straightforward statistics and value for money analysis. Nor was this the first time Transform has faced this sort of hurdle. In 2003 Tony Blair requested a report on UK and international drug policy from his Number 10 Strategy Unit. Transform's FOI requests for this document were met with a series of rejections, firstly on the basis that it was a 'private piece of work' and later that it contained 'security sensitive' information. When it was finally leaked in full to the Guardian in 2005 it became clear that it did not contain anything remotely security sensitive - indeed the 50 or so redacted pages in the censored version that was belatedly released by the Cabinet Office appeared to be entirely random (background and document summaries here). What follows is a time line of the process that Danny had to go through in order for Transform to access factual and statistical research material of the kind that democratic governments ought to make available as a matter of course. We should perhaps not be surprised; punitive responses to drugs are rooted in distinct moral ideologies and political posturing, not evidence of effectiveness. Any juxtaposition of the rhetorical prohibitionist fantasies with empirical reality is untenable for a Government deeply committed to a 'war on drugs'. In the context of a rhetorical and actual war on drugs, especially one that has evidently delivered increasingly counterproductive outcomes, despite ever more resources being poured into it, the Government's only recourse is to propaganda. Anything, certainly anything based on credible academic research, that might contradict the view that the war is being won must be either suppressed, spun or sacked, lest reality be exposed to meaningful public scrutiny, at which point the whole prohibitionist paradigm is threatened. This sorry FOI tale could not make that political reality more clear. The ten-year drug strategy review is announced, and a review consultation process for the next ten-year strategy launched – an event of potentially huge significance for drug policy in the UK. 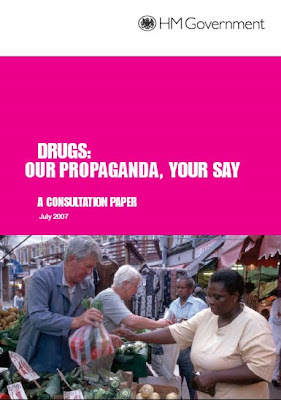 Transform felt that this public review and consultation process, billed by the Home Secretary as the ‘largest ever public consultation on tackling illegal drug use’, would usefully be informed by any research the Government had undertaken or commissioned to evaluate the effectiveness of the different elements of the strategy, on various criteria. The Government has made repeated commitments to ‘evidence based policy’ – so we asked to see the evidence - not least the evidence they were nominally basing their decisions on. Transform was aware that various unpublished research existed, although we lacked specifics beyond information that a ‘value for money’ study had been commissioned by the Home Office to inform its strategy review process. This piece of work – undertaken by independent academics (including the highly respected Christine Godfrey from York University) – was precisely the sort of objective evaluation that should be informing the public review and consultation process. As this was publicly funded research, was purely evaluative and did not contain advice to ministers, and did not contain security sensitive information, it seemed to be clearly in the public interest for it to be made available to inform the public strategy review/ consultation process. All unpublished research undertaken or commissioned to inform the strategy review process. All unpublished research undertaken or commissioned by the Home office since 1997, including research that was not completed or is still not completed, into the effectiveness and/or efficiency of the Government's Drug Strategy in preventing drug use and drug harms, or reducing drug-related offending. Any unpublished research undertaken or commissioned by the Home Office since 1997, including research that was not completed or still is to be completed, which examines the value for money of the Government's Drug Strategy. "We have estimated that the cost of answering your requests would exceed the £600 limit and we are therefore unable to comply with it"
....the Home Office is not obliged to comply with any information request where the prescribed costs of supplying you with the information exceed £600. The £600 limit applies to all central government departments and is based on work being carried out at a rate of £25 an hour, which equates to 3 1/2 days work per request. ‘It is of concern that the evidence presented, and the interpretation given, are not based on rigorous scrutiny." The Government’s public drug strategy consultation process closes, with the various Home Office strategy evaluations requested by Transform resolutely unpublished and unable to inform public debate or any aspect of the review consultation process. Following a separate FOI request to the Treasury, Transform secures the release of a previously unpublished ‘Stock Take of Anti-Drug Interventions and Cost Effectiveness’. The overall impression from this document is one of quite staggeringly poor evaluation, based around ill thought out targets, themselves based on meaningless process measures or proxy measures, all built around a rudderless, and politically determined policy. The quality of outcomes, even based on the data available, clearly does not support the strategy as it is presented. “There is little evidence on cost effectiveness of CJS activities. However, while insufficient to form robust conclusions that little we do have does not offer strong support”. Despite failing to secure release of the relevant documents in time for the consultation and review process a renewed FOI request is made to the Home Office, this time specifically for the single named document, the 'value for money' study (with which Christine Godfrey was associated) - to avoid any potential for the £600 cost exemption to be re-deployed. A response is promised by March 6th. “This exemption is a qualified exemption and provides that information can be withheld because the material was used for the formulation of Government policy. Our reason for this is because the work informed the policy development work undertaken by the Home Office and Other Government Departments in formulating and publishing the new Drug Strategy. The material is also reflected within the published appendices within the new strategy document pertaining to the most recent evidence review on the strategy and on the resources being invested by Government Departments for delivery of the Drug Strategy. Section 35 is a qualified exemption under the Freedom of Information Act and therefore requires the public interested balancing test to be considered, I have outlined this below. In favour of the release of this information is the general public interest in openness and transparency in policy making and discussion which may lead to increased trust and engagement between the public and the government. Such openness makes government more accountable to the taxpayer in terms of the quality of decisions taken, and the spending of public money. In addition openness enables individuals to gain a better understanding of decisions which directly affect them, and therefore make informed contributions to public debate. Reasons in favour of withholding the information under section 35(1)(a) are that advice should be broadly based, there may be a deterrent effect on experts or stakeholders who might become reluctant to provide advice because it might be disclosed. Further reasons are that the impartiality of the civil service should be protected; it might be undermined if advice was routinely made public as there is a risk that officials could come under political or public pressure not to challenge ideas in the formulation of policy, thus leading to poorer decision making. The analysis work helped inform the development work on the new Drug Strategy and is reflected within the evidence review and resources appendices within the new strategy document. It is important to be clear that the requested document was an independent academic evaluation of the drug strategy's effectiveness as related to its costs. It was factual/statistical analysis, not advice to ministers, and it had absolutely no bearing on the impartiality of the civil service - who were not responsible for it. The reasons given for withholding it were clearly spurious. On May 19th Transform therefore took the only available course and requested that the decision be subject to an internal review. The Home Office informs Transform, in response to a follow up inquiry, that the original request for an internal review has been ‘lost’. August 21st is given as the date by which a full response will be provided. The Home Office informs Transform that the review process is taking longer than anticipated and ‘with regret’ the date for a full response is moved back to October the 2nd. The Home Office informs Transform that the review process is taking longer than anticipated and ‘with regret’ the date for a full response is moved back to November 2nd. “In summary, I consider that the exemption provisions of s35(1)(a) were correctly applied to the information held at the time your original request was being handled. Now that the 2008 Drugs Strategy has been approved and published, and given that this information in the analysis is both statistical and factual in nature – i.e. not solely opinions or thoughts, but based on hard-facts and calculations – the provisions of this exemption, the supporting harm, prejudice and Public Interest Test arguments no longer favour withholding this information under this exemption"
However, the review also concludes that non-disclosure of the document can and indeed will be maintained for the entire document on the basis of (the previously unmentioned) section 36 of the FOI act which covers ‘Prejudice to the effective conduct of public affairs’. Transform also learn that invoking section 36 of the FOI requires ministerial approval, and that such approval has been sought and granted. “given that this strategy is still in the early stages of being implemented, it is felt that the likelihood of prejudicing the delivery of all areas of this strategy is fairly significant at this time. Transform entirely rejects both of these arguments as both unfounded and mis-applied, and immediately appeals the Home Office decision to the Information Commissioner’s Office. The Information Commissioner makes a full review of the case including a number of discussions with the relevant Home Office officials, finding against the Home Office, ordering them (and legally obliging them under the FOI act) to revisit the decision to withhold release of the document, the presumption being that release will be forthcoming on the basis that the public interest arguments made were inadequate to justify non-release. The Home Office finally concedes, and agrees to release (a redacted version of) the report. ‘This is believed to be the first time that a public body has openly refused to release information in order to manage the news better’. Following the Economist coverage, the Information Commission informs Transform that the Home Office has now agreed to release the document before the NAO document is published. It has requested that it is released before Christmas. Home Office informs Transform that the document will be released on 21 January 2010 – two and half years after the initial request, and two years after the public consultation on the drugs strategy it could usefully have informed has closed. Check the Transform blog in the next few days for updates on this story - and a full report on the (un-redacted portions of) the report when we have finally read it. And finally, if anyone reading this far has an unredacted version of the report - please send it (anonymously if you prefer) to Transform (info@tdpf.org.uk). Seriously, we are all grown ups here and this has gone on for far to long. Update: 13.30pm 21 January: It's worth a look to discover what the Home Office thinks is too sensitive for public viewing. What it shows is a basic lack of meaningful evaluation, and that what little evidence they do collect is clearly unable to demonstrate effectiveness or value for money, especially on the enforcement side where most of the resources are expended. It provides a stark contrast to the absurd rose-tinted picture painted by the 2007 consultation document produced by the Government (see below). That we were presented with that piece of shameless propaganda and not this (only now released) academic research is scandalous and should rightly be a source of anger and concern to all in the drugs field involved in the review consultation process, regardless of their policy views. Nor were the problems of poor evaluation/data and poor outcomes that the report demonstrates previously unidentified. The CSR Treasury stock take from 2001, released under a separate Transform FOI request (see Feb 5th 2008 entry in the Time line below), tells an almost identical story. They had 6 years to address these obvious failings (in data collection and evaluation - let alone outcomes) and utterly failed. There can be no excuses. The report also demonstrates that the various justifications (see below) given for its suppression during the strategy consultation, and for the following 2 years, were entirely spurious. The Home Office have behaved pathetically, like children in a playground with a secret, and treated the public with contempt in the process. They still are; note the ridiculous redaction of 'SOCA' throughout, except in a footnote referring to one of the redactions (they can't even do censorship properly). This saga was an attempt to conceal a piece of research that showed the policy in an unflattering light, and its censorship was purely political; a disgrace for the Government and particularly for the Home Office and ministers directly involved. We will provide a more detailed analysis later, but worthy of note is the item in table 3 on page showing expenditure by police in 05/06 - £2 billion out of £3 billion total expenditure, £1.7 billion of which is 'indirect costs of dealing with drug-related crime'. It looks suspiciously as if it fits with Transform's analysis that enforcement creates the very costs that prohibition is supposed to reduce. "The withholding of this report demonstrates yet again how the Government is committed to the rhetoric and fantasy of success of the current strategy, whilst doing its damnedest to keep the truth out of sight of the public. The edifice of prohibition comes crashing down as soon as evidence is pitched up against it. Ultimately we are being duped into supporting a policy that is demonstrably failing to deliver anything even approximating to value for money"
Alan Johnson is leading for the Government in trying to convince us that it is curbing the worst excesses of alcohol retailers. Apart from the fact that the Government has failed to take on the drinks industry with any degree of principle, Alan Johnson's criticism of some retailers as irresponsible, smacks of hypocrisy of the highest order. “Alcohol-related crime costs the UK billions of pounds every year and while the vast majority of retailers are responsible, a minority continue to run irresponsible promotions which fuel the excessive drinking that leads alcohol-related crime and disorder." But he is also charged with overseeing the control of illicit drugs, the (ever growing) market for which he has chosen to give in its entirety to organised criminals and unregulated dealers, thereby losing any control of the trade whatsoever, pushing up the street price, fuelling the majority of acquisitive crime and bringing misery and mayhem to some of the most deprived communities on earth. In the grand scheme of things who do you think is being more irresponsible? "[LEAP] believes that all drugs should be legal and regulated. The argument in favor of regulating these drugs is not that they're harmless, but rather that they're so dangerous they should be controlled by the government. Remember that under prohibition the government has no control. It's the violent drug dealer who decides the price, purity, cutting agents, advertising methods, business location and hours of operation. And these drug dealers certainly are not asking kids for ID, or encouraging their customers to seek addiction treatment. We need to move away from prohibition and begin considering models that give the government control over the market for these drugs. I received a letter from Downing Street this week, in response to my meeting with Prime Minister Gordon Brown to call for an Impact Assessment of the Misuse of Drugs Act. In July of last year I met with the PM to ask the Government to compare and contrast the impacts of the current prohibitionist legislation with alternatives, including legal regulation and control. Here is the briefing that I gave him. "We do not intend to undertake an impact assessment comparing the costs and benefits of different legislative options for domestic drug policy. We see no merit in embarking upon such an undertaking in view of our longstanding position that we do not accept that legalisation and regulation are now, or will be in the future, an acceptable response to the presence of drugs." "We are working to ensure that UN drugs activity is based on evidence and effectiveness..."
Do not forget that the head of the UN Office on Drugs and Crime has identified the Drug Control System as the cause of much of the 'drug problem'. But there's more - the absolutist position - that regulation will not be acceptable now "...or in the future..." Yes folks, that means for ever! "The methodological challenges involved in attempting to calculate the scale of the drugs market (supply and demand) and the costs of its harms are very significant." Oh, so it's too hard is it? I can think of many experts from all round the world who would be delighted to assist in this task. At any rate, this "challenge" is created by gifting the market to unregulated dealers in the first place. With David Cameron back pedalling on his previously held position (when he sat as a backbencher on the Home Affairs Select Committee in 2001/2), that the UK should initiate a debate at the UN on alternatives to prohibition, the outcome of the upcoming general election is unlikely to herald early reform in the right direction. Should you wish to ask your MP or parliamentary candidate if they support an Impact Assessment, feel free to use our briefing or contact us for advice. Transform will be bringing you more on drug policy election shenanigans over the next few months. Thanks to Peter Sarosi from HCLU for producing this short film featuring Transform's new publication 'After the War on Drugs: Blueprint for Regulation', filmed at the recent DPA conference in Albuquerque.